We thought it would be fun to head to Louisville, Kentucky last week to get into the Kentucky Derby spirit since The Derby is just a few short weeks away. In typical Bunkycooks fashion, we went right to the source to find out how to make some of the best Derby day dishes and learn about the traditions behind those recipes. 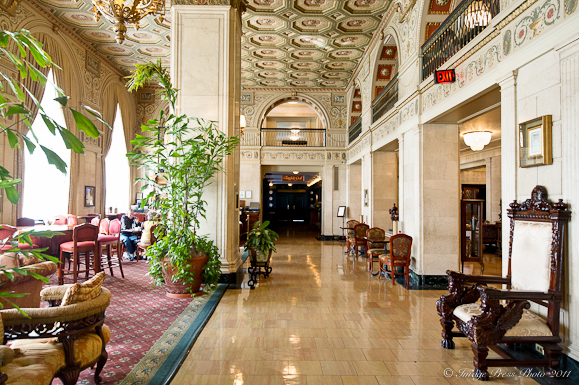 When you think of Louisville, The Brown Hotel certainly comes to mind as one of the grandest hotels in the city. What better place to start this On the Road adventure than The Brown Hotel where The Hot Brown sandwich originated! The Hot Brown is in it’s 85th year, so it was time to celebrate that anniversary and the upcoming Derby with an original Hot Brown sandwich (or maybe two!). 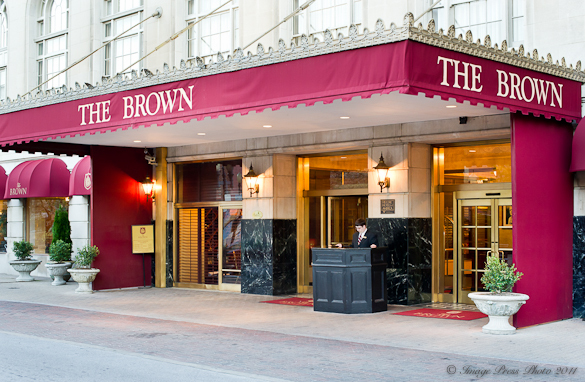 The Brown Hotel has received many awards including the Top 25 Best Hotels in North America by Condé Naste Traveler Magazine, and Best Hotel/Resort in Kentucky by Kentucky Monthly Magazine. Their English Grill fine dining restaurant has received AAA’s Four-Diamond restaurant award and was recognized by ForbesTraveler.com for the Chef Table Top Ten. The lobby is so grand and elegant. We thought for a few minutes we might have been on a roll and hit on another spooky hotel when a pilot at The Thoroughbred Lounge (the lobby bar) mentioned that a few flight attendants have seen ghosts. However, I personally think these gals have had a few too many Kentucky bourbons before their bedtime, don’t you? I could not find any tales about uninvited, special guests, so that’s my opinion and I’m sticking to it. 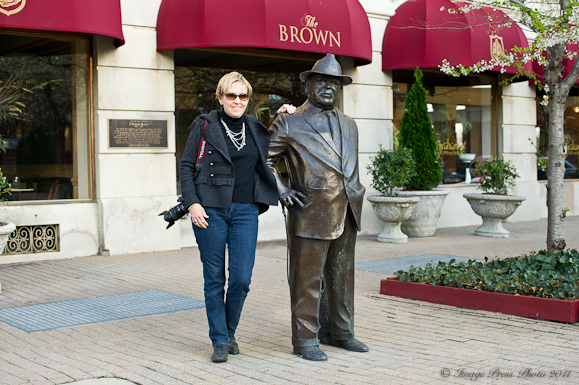 There is a statue of J. Graham Brown outside the entrance to The Brown Hotel. The Brown Hotel was built in 1923 by J. Graham Brown, a local wealthy businessman. 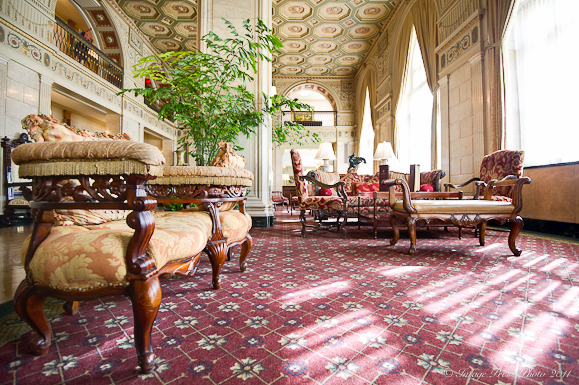 As with many of these grand old hotels, it has a rich past and has been visited by many well known guests such as the Duke of Windsor, Elizabeth Taylor, Harry Truman, Gene Autry and Muhammad Ali. 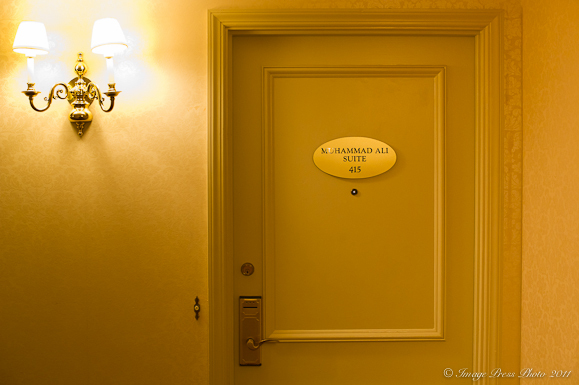 I guess he really stayed here if they named a suite after him! The hotel opened during prohibition (which lasted until 1933), but that sure didn’t stop anyone from imbibing. Too much late night partying and dancing is one of the reasons we now have the Hot Brown! The hotel has also had its share of less glamorous times throughout the years. One of those times was when it flooded in January of 1937 when they Ohio River rose and overflowed into the City of Louisville. A resurgence came along for the City of Louisville and The Brown Hotel with the onset of World World War II. Prosperity of the hotel continued until the city’s residents started moving away from the city in the late fifties as roads and transportation made it easier to move out where there was more land. Mr. Brown passed away in 1969 and the hotel closed two years later in 1971. It was eventually purchased in 1983 and restoration began. In 1990, the Camberly Hotel Company assumed management and the hotel was restored to its original grandeur. 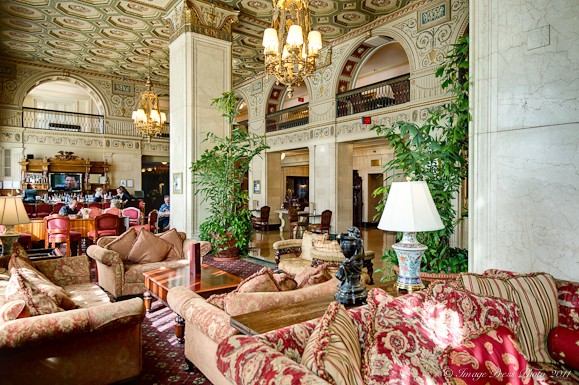 Have you ever been to the Biltmore Hotel in downtown LA? It’s amazing how much this hotel lobby looks like the lobby of the Biltmore! I have a dear friend who hosts a Derby Day party every year. My guess is she has hosted that party for at LEAST the last 25 years. She always serves Derby Day pie, which is pretty much a pecan pie with chocolate chips (talk about gilding the lily!) fpr dessert, and mint juleps as her guests arrive. It’s a lot of fun! Beautiful post. The hotel looks incredible. It’s so funny that you posted this. My friend has been promising to teach me how to make a KY Hot Brown on camera for a while and we have talked about doIng it before the Derby this year. She’s a Kentucky gal and I’m sure the recipe is in her blood, she talks about it so fondly. I bet you could get anyone to spill their secrets. You have the power! Another wonderful feature, Gwen!!! Oh Boy you have done it again Gwen!!! Another lovely post that gives readers the feeling of really being there with you. The ceilings are fabulous. My husband is a plaster by trade. He loves the old buildings and the fine artisans detail work. He can craft much of the old style cornices and plaster details. Today they fabricate those details. I can just imagine a trip here, wile he was oohhhing and aaaahhing the fine craftsmanship I’d be eating! What a fun expedition! I’ve been hearing about the Hot Brown for years but have yet to try one. It’s definitely on my list this year. Yours looks incredible! another great post Gwen – you and Roger are having too much fun! How much fun was this story! 85 different versions of the Hot Brown, oh my that’s a meal a night for a long time 😉 Congrats on the launch of your series, it’s going to be such a great read just like this one. Wonderful post! 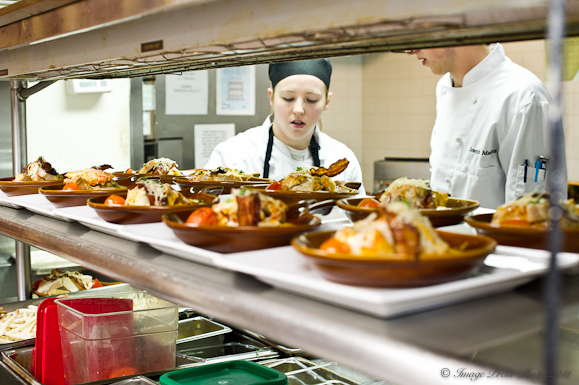 Travelogue with great food – how could you go wrong? I’ve heard of a hot brown and wondered what it was. After viewing the video, it seems like something that everyone should try! This place looks awesome. I am new to your blog and have been looking over your posts. They are great. Your photos are awesome! Most Kentucky home cooks make Hot Browns during Thanksgiving and Christmas holidays, when leftover turkey is plentiful. The dish is very rich! It’s a wonderful brunch addition….and the perfect late night offering when the bourbon has been flowing a little too freely.